The SMD Ouessant, which now becomes the country’s first submarine museum. into the country’s first submarine museum. It was opened to the public on Nov 22, 2011. This French-made Agosta 70-class submarine, built in 1979, measures 67.5m long, 11.7m high, and 6.5m wide. It weighs 1,300 tonnes and housed a crew of 54. The submarine was used for training submariners between 2005 and 2009 following the purchase of two submarines by the Ministry of Defence. Today, this submarine serves as one of Malacca’s many museum attractions. Open daily, the museum allows visitors to get a feel of what it is like to be a submariner. Outside the museum, under a sheltered enclosure, visitors can get a closer view of two decommissioned Royal Malaysian Air Force fighter jets — a RMAF Skyhawk and the Northrop F5. 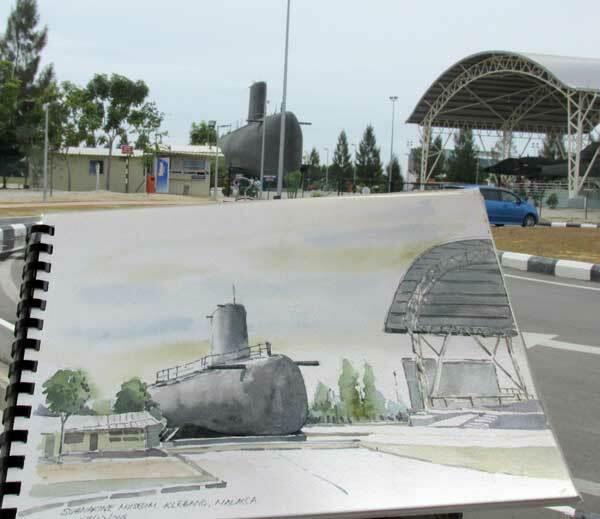 I sketched the view of the submarine from one of the recently completed pavilions just outside the gated compound of the museum. 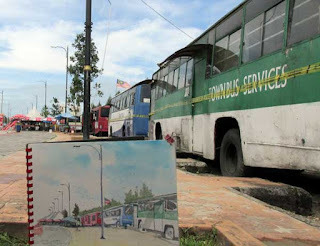 Work is undergoing to spruce up the surrounding area and new facilities such as a surau, toilets, and an air-conditioned eatery have yet to open. A kilometre north of the Submarine Museum is another popular recreational spot where picnickers have direct access to the sea. Here, an empty field populated by more than 50 stage buses, gives an impression of a bus terminal when viewed from afar. Upon closer inspection, these are decommissioned public buses that had been converted to serve new roles. Thirty or so such buses have been turned into Bustels or bus-hotels, each equipped with two air-conditioned rooms with beds and other accommodation facilities. According to the clerk manning the Bustel office, the rooms are priced at RM90 each per night on weekdays, and RM130 on Fridays and Saturdays, and public holidays. Not far from the Bustel enclosure, lined up along the road are old buses that have been turned into souvenir shops and foodstalls. One bus had even been converted into a reasonably clean public toilet. I decided to sketch this row of buses after being told that their days were numbered. According to a souvenir trader here, there were plans to close down the area as the location had been earmarked for development. However, she could not tell me if the entire fleet of buses would be discontinued or moved elsewhere. I recall the first time I visited Malacca some 30 years ago. The water’s edge was much nearer to Jalan Klebang Besar, the coastal thoroughfare. A trader at a hawker centre by the road had complained to me about the erosion that was slowing eating into his trading spot. He said it would be a matter of time before the hawker centre tumbled into the sea if the authorities did not act. I suppose his wish was fulfilled when the sea was pushed back more than a kilometre with a land reclamation project carried out over the past one decade. In fact, so much land has been reclaimed along Klebang beach that the new coastline now probably qualifies as a new township. THE Submarine Museum is 8.5km from the Malacca city centre. It is open daily from 9am to 5pm, Monday-Thursday, and 9am to 6.30pm Friday to Sunday. (It is closed from 12.15pm to 2.45pm on Friday.) Fees are RM2 per adult and RM1 per child. To get there, look for Dataran 1Malaysia, off Jalan Klebang Besar. There are signages showing the way to the museum. There is also ample parking just outside the museum’s gated compound. For details, call 06-282-6526 or 283-0926.